In Alain Ducasse’s splendid kingdom all citizens carry a copy of a little red book containing a set of core values. There’s 12 of them and here they are: passion, pleasure and sharing; harmony, leadership and rigour; curiosity, diversity and perfection; respect, daring and origins. The red book displays one-phrase-definitions of these keywords that read a bit like ancient Chinese poetry. "Love, and the rest will follow..." (passion), "remember your roots so that you know where to grow" (origins), "act in unison and concurrently" (harmony). It’s only words, you might say, thinking of a classic corporate identity toolbox that could be used equally well in Wall-Street-banks or in the soda industry. Yet this assumption turns out to be wrong when it comes to describing the work and the world of Alain Ducasse. I have met him a couple of times now and, recently, I had a private lunch with him at his restaurant at the Plaza Athénée grand hotel. Maybe I’m wrong but I’m convinced that I’ve come to know a man who lives by his ideals and who keeps his word. Needless to say that Mr. Ducasse is a great cook. He is, in fact, one of the greatest chefs of our time, maybe: of all times. He has managed to build a vast empire of high-quality cuisine stretching from Las Vegas to New York, from Tokyo to Hong Kong, from London to Paris and Monte Carlo. He’s a frequent traveller, a miles-millionaire, a man on the run somehow. Before each time he takes off, he says, he’s excited about what he will find in the world this time, which unknown dish will be served to him, which new sensation will show up before his eyes and on his palate. Ducasse is a real globalist, yet he’s searching for the best local food and food traditions. When we ate together, in a separée built into the bustling kitchen at Plaza Athénée, all food was local, it was French fare, exceptional produce: seafood from Breton shores, partridge from Limousin woods, vegetables and fruit from southern France and the Loire valley, Atlantic lobster, Norman butter, olive oil from Provence, Guérande salt. Ducasse talked about food, it’s producers and refiners, like a man in love. He spoke about the magic of a perfect meal, about his "excitement for the ephemeral" and he sounded like a philosopher. In front of the plates that were rolling in constantly he turned into a man just like you and me though. He chewed. He enjoyed. He savoured. He swallowed. He used his hands. He celebrated food, and he celebrated life, he shared a good moment. Haute Cuisine, he said, was a cocktail of experiences, of odour and texture and appearance. 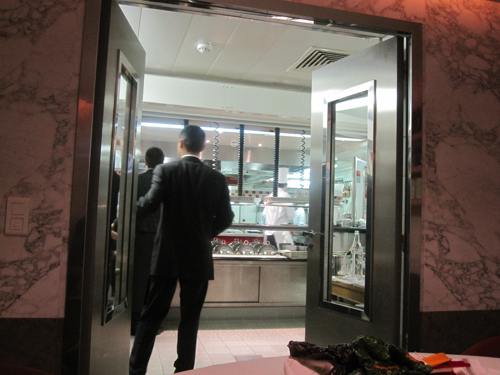 But , Ducasse said, there’s even more to a perfect meal - there's ambience; lighting, room temperature, colours. You wouldn’t think that a man with his biography could be so obsessed which such seemingly minor problems. It was on the 9th of August 1984 when Ducasse’s whole life changed brutally. He was 28 back then, a young chef just decorated with his second Michelin star, when a small Piper Aztek with him and five other people on board crashed on route between St. Tropez and Courchevel in the French Alps. Ducasse was the only survivor, he lay there for hours waiting to be rescued until a helicopter finally arrived. "My whole lifetime since the crash is a bonus", Ducasse said during our lunch, "and I’m fully aware of it". After the accident, he had to be operated on 15 times. His back was injured, his legs, his eyes, but if you saw him today, sitting next to you at the table sharing a meal, you wouldn’t notice anything. This 9th of August was the turning point in his life, of course. He says, it was followed by a long period during which he was caught up in a deep trauma. "But I woke up again. And I went on." He did it breathlessly, eagerly. At the age of 33 he was the youngest chef ever to be awarded three Michelin stars at Louis XV in Monte Carlo. 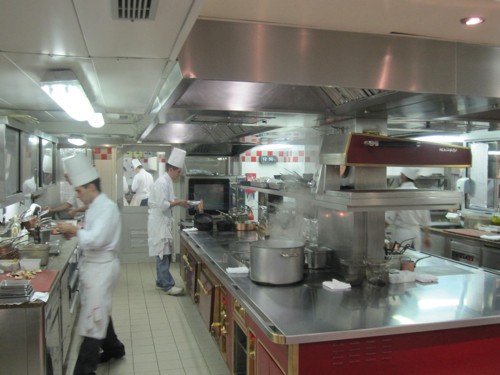 Soon, he took over Robuchon’s restaurant in Paris, running two three-star-restaurants at once. At that time he started building his empire, subconciously at first, then ever more strategically. Ducasse was reaching out into the world, into new spheres, he was mixing genres, inventing new ways of dining (like "Spoon") but also hurrying to the rescue of classic bistros too (like "Rech"). The chef became a flying chef, a manager of chefs, a chef of chefs. At first, the critics didn’t like that idea, they started to downgrade his work. They had to get used to the idea that a cook can be a manager. That a chef can successfully organize the work of many chefs wherever they roam. It was Ducasse who convinced them. And maybe only he could do it. A man whose passion for food is undeniable. A man whose skills are unquestionable. A Frenchman, with a global perspective, and there are not many. 1400 people are working for the "Ducasse Groupe" these days (representing 40 nationalities, as the press kit says). 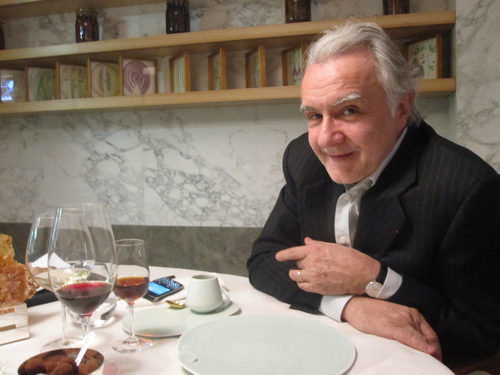 This army mans 27 restaurants in 8 countries, and still they all have only one boss: Alain Ducasse. He is ready for change on a daily basis. He has to keep up. But the financial crisis hit haute cuisine as well, "Ducasse Groupe’s" results were poor in 2009. 2010 was better again, yet there’s no way of just betting on success. You have to take risks, you have to be ever better, "driven by clients", Ducasse says, who are "excessively demanding", who are seeking perfection. "You wouldn’t believe what kind of stress that means for us", he said during our lunch, he used the French word "galère", a colloquial metaphor meaning heavy workload like on a galley. He looked tired, for a second. At Plaza Athénée, he has re-defined his concepts of haute cuisine in a spectacular way. I’m pretty sure that food critics will soon report a revolution. Together with his chef Christophe Saintagne, Ducasse has radically changed direction, and is now moving towards a product-centered, radical concept. It’s almost a one-product-one-dish-approach and the results, believe me, are almost shockingly delicious. Don’t expect fancy, long French titles for the dishes at Ducasse’s in Paris anymore. The menu now just lists: "Crevettes" or "Tartare de langoustine", you’ll find "Légumes et fruits" (vegetables and fruit) or "Homard, pommes de mer" (lobster and "sea-potatoes") – and that’s it. No more words, no chi-chi, no bling-bling. Ducasse’s new cuisine is pure, it’s almost severe, it’s crystal-clear.During lunch he said: "We’re evolving into a new, sober Gothic era. It took us 25 years to get there. All our experience goes into it, all our knowledge, all our techniques, the gestures, the culture, the whole French DNA". That’s big talk, just like the high values in the little red book mentioned above. But once you’ve come and tasted "vegetables and fruit" at Ducasse at Plaza Athénée you’ll know that this man really means it. And that he’s keeping his word.